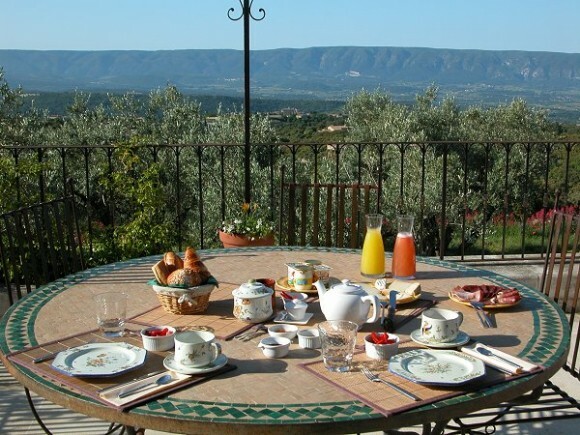 The sweeping views are glorious from L’Asphodèle, a uniquely-designed bed and breakfast nestled in the verdant “grand calme” a mile up the hill from Gordes, the iconic village of stone edifices ‘perched’ on the side of large hill. 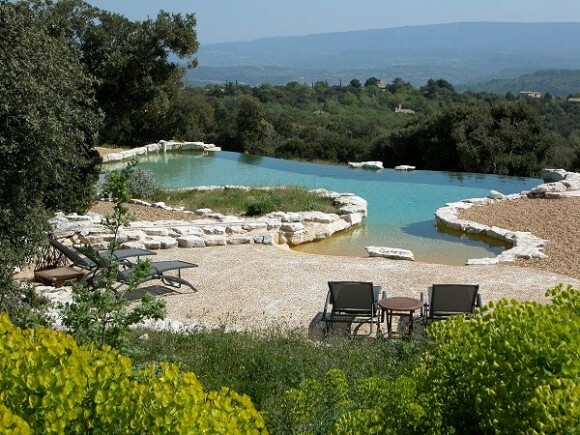 Upon your arrival at L’Asphodèle, your first glance of the vista is framed by a 45-foot pool ringed by large rocks where the far edge overflows, marrying aqua blue with the dense green of the evergreen oaks. 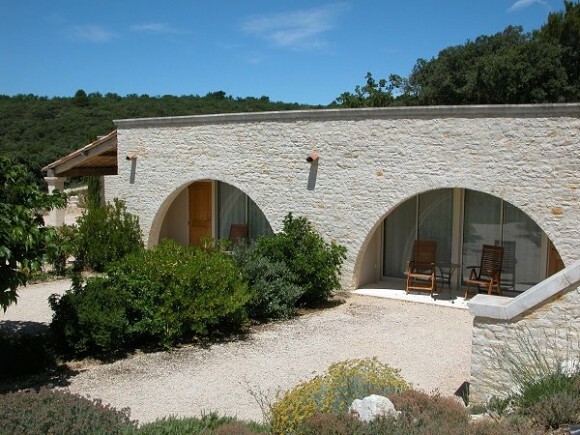 Four of the five rooms, which are below the main house, have a loggia, a roofed, arcaded open porch, where you can meditate on your private views of the countryside and Luberon mountains on the horizon. Each room has its own colorful Provencal personality, and a sitting area as well as chairs and tables in the loggia. 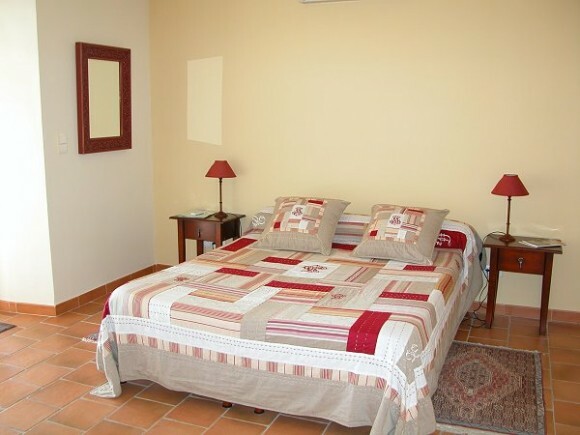 Beds are queens with an option of two singles, and the four rooms with a loggia have a dual heating and air conditioning unit. The continental breakfast – a copious buffet mind you – is served from 8:30 a.m. to 10:00 a.m. either in a dining room or on a large terrace which faces the Calavon valley. Gordes is a movie set where everyone is hitting his or her marks (all in the proper places). Yes, it may be the quintessential Luberon version of mass market tourism, but the blast of adrenaline and excitement makes you feel vibrant and alive in an amusement park thrill ride sort of way. And Gordes is one of the very few places in the Luberon where you take a table at a café, gaze at the beautifully laid out scenery, which looks just like a glossy brochure, and revel in the guilty pleasures of people watching – those upscale couples who are “être à l’abri du besoin” (free of money worries). At night, even in high seasons, the streets empty out, and the passive Château glistens against a cobalt blue sky. The weekly market offering fresh produce and other locally-produced Provencal products takes place every Tuesday morning in the main square. For casual dining and good wines, check out the Casa Rosario a few yards north of the main square on the route de Murs, and the wine bar L’Estimanet on the main square. 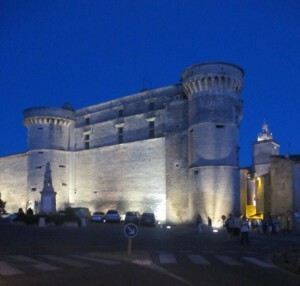 Directions: From the main square in Gordes where there is a roundabout, take the road up the hill opposite the Château – D15, the route de Murs. One mile up the slope take the second road on the left after the sign leaving Gordes. Follow the signs for about two-fifths of a mile to the L’Asphodèle. Note: Recommended to not use your GPS once you find yourself in Gordes. 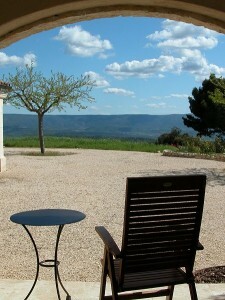 This entry was posted in Reportage and tagged B&B, Gites, Gordes, Hotel. Bookmark the permalink.